Page Chronology: 2013Feb06, page initially uploaded. 2013Feb07, added data/burial for Susan Culbertson Smith Burns, added Fairfield.Twp plats indication Smith locations, refreshed Culbertson tree, added Hiram Smith tree. 2015Mar, Burial data revised, data added to trees, tree developed by Torey&BZ for Lillian L. nee Pettis (adopted) Culbertson x Charles E. Abel 1st, Orange Paul 2nd. Culbertson Keith J Culbertson Etgeton Marlene J. 1932/?-2000/IA; also buried in Fairbank.IA Cem (on the Fayette/Buchanan.Co line) Sep 13, 1927 Aug 1961 Fairbank Oran Twp WWII; Lot 90. Need parents of Keith. G/son of Samuel Thomas Culbertson 1884/MO-1923/Delaware.Co.IA & Grace Ethel Edmunds 1886/Delaware.Co.IA-1983/Edgewood.IA. Census1920, Honey Creek.Twp, Delaware.Co.IA: SamT35, GraceE33, EdnaL12, DonE7, SamuelB6m. Keith's g/f Samuel died on Honey Creek farm in 1923. Census1930, Greeley, Elk.Twp, Delaware.Co.IA: Culbertson; GraceE43 keeping boarding house, Edna22, DonaldE17, S.Burton10, KetihJ2 g/son. Census1940, Greeley.IA: Grace52, Edna31 telephone operator, Barton20 feed store clerk, Keith12 g/son. Culbertson Charles Lawrence Culbertson Culbertson son of Warren Samuel Abt Apr 01, 1901 Abt Apr 04, 1901 Grandview Fayette Sec G, lot 325, burial #796. Son of Warren Samuel Culbertson 1875/Smithfield.Twp-1953/Fayette.IA & Emma Zoe Kuhens 1878/Illyria.Twp-1967/Fayette.Co.IA County Home. Culbertson Emma Zoe Kuhens Culbertson Warren Samuel 1875/Smithfield.Twp-1953/Fayette.IA 4 May 1879 27 Jul 1962 Grandview Fayette Sec G, lot 325, 3rd from S, burial #2591. Dau of John Kuhens 1838/Noble.Co.OH-1908/West.Union.IA & Rebecca Jane Wroe 1843/Greene.Co.PA-1944/West.Union.IA. Ch: Charles Lawrence1901-1901, Edith Caroline 'Coralie'1902-1984. Culbertson Harrison L Culbertson Culbertson son of Thomas Montsin 20 Aug 1882 25 Aug 1884 Grandview Fayette Sec A, burial #434, burial 1884Aug27, listed child; no lot, age, cause or relative given, assume buried in childrens area, bz/2013. Age, 2y0m5. Son of Thomas Montsin Culbertson 1821/Chester.Co.PA-1893/Hand.Co.SD, of sec 8 Smithfield.Twp & Celestia Ann Lawrence 1837/Chautauqua.Co.NY-1889/?SD or NE?. Harrison born in Sec 8, Smithfield.Twp. Culbertson Warren Samuel Culbertson Kuhens Emma Zoe 1878/Illyria.Twp-1967/Fayette.IA County Home. Jan 13, 1875 Apr 25, 1953 Grandview Fayette Sec G, lot 325, 2nd from S, box, burial #2301. Son of Thomas Montsin Culbertson 1821/Chester.Co.PA-1893/Hand.Co.SD, of sec 8 Smithfield.Twp & Celestia Ann Lawrence 1837/Chautauqua.Co.NY-1889/?SD or NE? Ch: Charles Lawrence1901-1901, Edith Caroline 'Coralie'1902-1984. Culbertson Ida L Lawrence, Laurence Culbertson Morris E. 1846/PA-1906/Illyria.Twp, 2nd husb; 1st husb (divorced), Capt. Charles E. Pettis 1842/Chautauqua.Co.NY-1919/Warren.Co.PA (Capt. In PA Cav) 1 Oct 1845 4 Oct 1915 Wadena Cem Wadena Sec 2. Need parents. Ch with Charles E. Pettis: Lillian Margaret nee Pettis adopted Culbertson 1867/PA-1919/Fay.Co.IA (1st husb Charles E. Abel1864-1905, 2nd husb, Orange Paul 18630-1922). Ch with Maurice Eugene Culberston: Ernest Eugene1877, Ida Alli1879, Harry &Bertie died infancy, likely in PA.
Culbertson Morris Eugene Culbertson Culbertson suspect son of Ernest Eugene 7 Jul 1911 7 Jul 1911 Wadena Cem Wadena No info to verify burial; No stone found. Assume a son of Ernest Eugene Culbertson 1877/Illyria.Twp-1959/Illyria.Twp & Catherine Mae 'Katie' Grummitt 1880.Fay.Co.IA-1952, Illyria.Twp? Culbertson Morris Eugene 'Morris' Culbertson Lawrence Ida L 1845/PA-1915/Illyria.Twp, 1st husb (divorced), Capt. Charles E. Pettis 1842/Chautauqua.Co.NY-1919/Warren.Co.PA (Capt. In PA Cav) 4 Oct 1846 16 Jul 1906 Wadena Cem Wadena Sec 2. Co K 199 Reg PA Vol Inf Civil War; GAR. Son of thomas Monstin Culbertson 1821/Chester.Co.PA-1893/Hand.Co.ST & Jane M. Boughton 1825/Chautauqua.Co.NY-1849/Warren.Co.PA. Ch: Ernest Eugene1877, Ida Allie1879, Harry, Bertie. Culbertson Dean Carlton Culbertson Culbertson son of Leroy Glesner 6 Mar 1915 21 Nov 1944 West Union West Union Son of Leroy Glessner Culberton 1882/Henry.Co.IA-1924/St.Petersburg.FL & Maude Mabel Blunt 1882/West.Union.IA-1965/St.Petersburg.FL. Served in 406th INF 102 Div. Buried at Masstreot, Netherlands; killed-in-action Oachen, Germany. Culbertson Leroy Glessner Culbertson Blunt Maude Mabel 1882/West.Union.IA-1965/St.Petersburg.FL Oct 8, 1882 abt 16 Oct 1924 West Union West Union War Veteran. . Burial date 1924Oct18. Son of Houston Culbertwon 1835/Mansfied.OH-bef1900/IA? & Frances A. Hough 1854/PA-?/? Ch: Dean Carlton1914-1944. Culbertson Maude Mabel Blunt Culbertson Leroy Glesner 1882/Union.Twp-1924/St.Petersburg.FL 10 Aug 1882 28 Sep 1965 West Union West Union Dau of James Henry Blunt 1853/OH-1931/Union.Twp & Florentina Mary Nefzger 1853/OH-1926/Union.Twp. Ch: Dean Carlton1914-1944. Burns Susan J. 'Susie' Culbertson Smith Fred 1865/Fairfield.Twp-1902/Fairfield, 1st husb; 2nd husb, JonathanE Burns 1862/IL-1932/McGregor.IA. 26 Aug 1871 9 Jan 1910 Grandview Fayette Sec G, Lot 323, in S half, burial #1002. Burial book lists death 1910Jan10 under Burnes surname, buried with 1st husb Fred Smith in lot 323, bz/2013. Dau of Thomas Montsin Culbertson 1821/PA-1893/SD & Celestia Ann Lawrence 1837/NY-1889/SD?. Ch with Smith: JessieG1891, FloydH1894. Ch with Burns: Lyle Burdell1908. Smith Frederick R. 'Fred' Smith Culbertson Susan 1872/PA-1910/Fayette.IA area, 1st husb. 5 Oct 1865 25 Dec 1902 Grandview Fayette Sec G, Lot 323, burial #825. Son of Hiram C. Smith 1834/Lorain.Co.OH-1916/Fayette.IA & Mary A. Reed 1835/NY-aft1909/?. Ch: JessieG, FloydH. Paul Lillian Margaret Pettis adopted Culbertson Abel Charles E. 1864/Essex.Co.NY-1905/Smithfield.Twp.res, 1st husb; 2nd husb, Orange Wendal Paul 1863/NY-1922/Fayette.IA. 29 Sep 1867 23 Jun 1919 Grandview Fayette Sec D, Lot 417, burial #1273. Dau of Capt. Charles E. Pettis 1842Dec26/?Harmony, Chautauqua.Co.NY-1919Jan16/Youngsville, Warren.Co.PA & Ida L. nee Laurence/Lawrence Culbertson 1845/?Chautauqua.Co.NY-1915/Illyria.Twp (Ida divorced C.E. Pettis, remarried Morris Eugene Culbertson1846-1906; Lillian took the Culberston surname). Ch; with Charles Abel: Harris Morris 'Harry'1892, Maria1898, Clyde Charles1899. Paul Orange Wendal Paul Yates Sophia H. 1867/Schenectady.Co.NY--1907/Smithfield.Twp, 1st wf; 2nd wf, Lillian Margaret nee Pettis (adopted) Culbertson 1867/Warren.Co.PA-1919/Main.St,Fayette. Jul 28, 1863 Oct 13, 1922 Grandview Fayette Sec D, lot 417, burial #1371. Son of John Clark Paul 1827/Saratoga.Co.NY-1912/Smithfield.Twp & Mary Anne Howe 1830/Saratoga.Co.NY-1909/Smithfield.Twp. Ch with Sophia Yates; Ida1885, Isaac Christopher1887, Harvey1889, Jennie1891, Josie May1894, Floyd1899, Beulah Blanch1904. Note: The Paul & Yates families associated several generations in NY/New England. Settled in Smithfield.Twp, associated with Wadena, Illyria.Twp & Albany/Lima, Fayette area, Westfield.Twp. Burials in Grandview Cem at Fayette and Wadena Cem. .................. 9 CULBERTSON, John b: 1794 in Penn d: Bef. 1860 in Deerfield.Twp, Warren.Co.PA Note 1: 08 Feb 2013 Culbertson last edited: Barry.Zbornik Hannibal.MO iowaz AT hotmail.com Note 18: 1850 Census: Deerfield.Twp, Warren.Co.PA. Culbertson: John56 innkeeper, Eliz58, Thomas30 carpenter, JohnH27 innkeeper, William19 miller, Mary22, Morris4, MarthaAnn2, JohnJ0, Ann Hollenback18. Note 20: 1860 Census: Deerfield.Twp, Warren.Co.PA. Culbertson: Wm.D26 miller, Susan26, Wm5, Emma3m, mother Elizabeth69. ........................ +UNKNOWN, Elizabeth b: 1792 in Penn d: Aft. 1870 in Strawberry.Pt area, Clayton.Co.IA? Note 10: 1850 Census: Deerfield.Twp, Warren.Co.PA. Culbertson: John56 innkeeper, Eliz58, Thomas30 carpenter, JohnH27 innkeeper, William19 miller, Mary22, Morris4, MarthaAnn2, JohnJ0, Ann Hollenback18. Note 12: 1860 Census: Deerfield.Twp, Warren.Co.PA. Culbertson: Wm.D26 miller, Susan26, Wm5, Emma3m, mother Elizabeth69. Note 15: 1870 Census: Strawberry.Pt area, Cass.Twp, Clayton.Co.IA. Culbertson: John47 farming $8k/1000, Polly Jane42NY, GeoD17, IraW15, Herbert13, SamuelH10, Louisa6PA, Milla2IA, Alonza9m, mother Eliz79PA, MattieA22PA teacher. ..................... 10 CULBERTSON, Samuel b: 1818 in PA Note 10: 1860 Census: Deerfield.Twp, Warren.Co.PA. Culbertson: Samuel42 oil speculator $1300/300 (adj of Harrison44), AnnaA42, MatildaM12. ..................... 10  CULBERTSON, Thomas Montsin b: 25 Jan 1821 in Chester.Co.PA d: 18 Apr 1893 in Bates.Twp, Hand.Co.SD Burial: Sand Creek Cem, Beadle.Co.SD Note 5: 1850 Census: Deerfield.Twp, Warren.Co.PA. Culbertson: John56 innkeeper, Eliz58, Thomas30 carpenter, JohnH27 innkeeper, William19 miller, Mary22, Morris4, MarthaAnn2, JohnJ0, Ann Hollenback18. Note 6: 1860 Census: ?? Note 8: Abt. 1865 Draft.Reg: Warren.Co.PA, T.M.Culbertson, 44y, 5'8+", gr eyes, br hair, fair complextion, born Chester.Co.PA. Note 10: 1870 Census: Tidioute area, Deerfield.Twp, Warren.Co.PA. Culbertson: Thomas48 farmer $2k/750, 2nd wf Celestria32NY, MorrisE23PA, Martha21PA, Frank11PA, EllenB8NY, Charles6PA, IdaB4PA, Saraha2PA, Lucy1PA. Adjacent is Lawrence: E.F.66VT, Percilla65Vt, MaryA25NY Note 11: 1872 Moved from PA to Sec 8 farm, Smithfield.Twp, Fay.Co.IA. Note 12: 1878 Fay.Co.IA.1878.Hist: Sec 8, Smithfield.Twp, P.O. 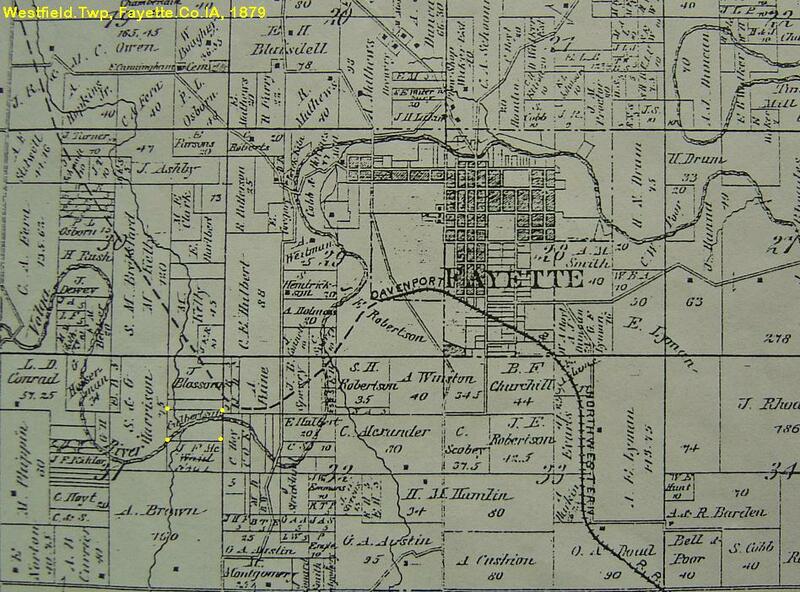 Fayette, birth 1820Jun25, has $5k farm in PA, came to Fayette.Co.IA 1872. Note 13: 1878 Still has a $5k farm in Penn. Note 18: 1880 Census: NEofNW, sec 8, Smithfield.Twp, Fay.Co.IA. Culbertson: T.M55 farmer/miller, C.A.41, F.D.21, Nellie19, C.L.17, I.B.15, C.E.13, S.J.9, M.C.7, S.W.5, R.L.3, L.J.5m, f/law E.P.76 shoemaker & m/law P.75 Lawrence. Note 20: 1885 Census: NEofNW, sec 8, Smithfield.Twp, Fay.Co.IA. Culbertson: T.M.64 farming, Celestia44, Frank24, Nellie23, Chas.21, Bella19, Sarah17, Susan13, Mary11, Warren9, Rocher7, Lulu4, Prissilla Lawrence78. ........................ 11 CULBERTSON, Morris Eugene b: 04 Oct 1846 in Tidioute area, Deerfield.Twp, Warren.Co.PA d: 16 Jul 1906 in Sec 33 farm, 1.5mi SW of Wadena, Illyria.Twp, Fay.Co.IA. Burial: Wadena Cem in Sec 2, Illyria.Twp, Fay.Co.IA. Note 4: 1850 Census: Deerfield.Twp, Warren.Co.PA. Culbertson: John56 innkeeper, Eliz58, Thomas30 carpenter, JohnH27 innkeeper, William19 miller, Mary22, Morris4, MarthaAnn2, JohnJ0, Ann Hollenback18. Note 6: 1860 Census: ?? Note 7: Abt. 1863 Civil War, Co K, 199 Reg PA Vol Inf, GAR. Note 8: 1870 Census: Tidioute area, Deerfield.Twp, Warren.Co.PA. Culbertson: Thomas48 farmer $2k/750, 2nd wf Celestria32NY, MorrisE23PA, Martha21PA, Frank11PA, EllenB8NY, Charles6PA, IdaB4PA, Saraha2PA, Lucy1PA. Adjacent is Lawrence: E.F.66VT, Percilla65Vt, MaryA25NY Note 9: 1872 Father T.M. Culbertson, moved from PA to Sec 8 farm, Smithfield.Twp, Fay.Co.IA. Note 10: Bet. 1874 - 1877 Arlington.IA 1915Oct17 paper: Ida's death notice states moved to near Fayette.IA in 1874; abt 1877 moved to homestead farm near Wadena (Illyria.Twp) for rest of life. 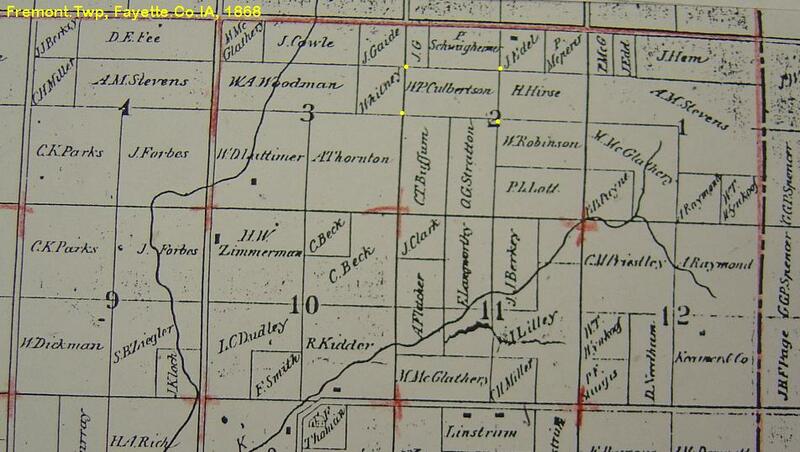 Note 12: 1880 Census: Near Gilson & Sargent in NW corner of Illyria.Twp, Fay.Col.IA. Culbertson: MorrisE34PA farming, IdaL35PA nee Lawrence Peters, s/dau Lillian12PA Peters, Ernest4IA, IdaA1IA. Note 13: 1885 Census: Illyria.Twp, Fay.Co.IA. Culbertson: M.E.38 farming, Ida39, LillianM17, E.E.8, IdaA6. Note 16: 1895 Census: Illyria.Twp, Fay.Co.IA. Culbertson: MorrisE48 farming, IdaL49, ErnestE18, IdaA16. 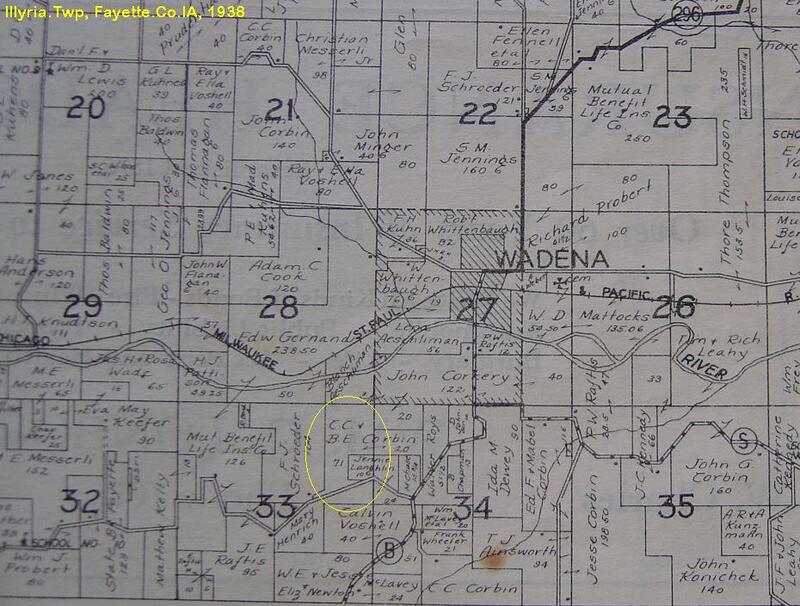 Note 17: 1896 Plat: 76a on Pleasant Ridge Rd, E1/2 of NE1/4, sec 33, Illyria.Twp, 1.5mi SE of Wadena, Fay.Co.IA. Note 19: 1900 Census: Illyria.Twp, Fay.Co.IA. Culbertson: Morris54PA farming, Ida55 5ch/3living. Note 20: 1905 Census: Illyria.Twp, Fay.Co.IA. M.E. & Ida Culbertson. Note 28: Arlington.IA 1915Oct17 paper: wf. Ida's death notice state Morris died 1905Jul16. .............................. +LAWRENCE, Ida L. Laurence b: 01 Oct 1845 in Suspect Chautauqua.Co.NY (bz/2015) d: 04 Oct 1915 in Sec 33 farm, 1.5mi SW of Wadena, Illyria.Twp, Fay.Co.IA. Burial: Wadena Cem, sec 2, Illyria.Twp, Fay.Co.IA. m: 20 Nov 1871 in St. Petersburg, Clarion.Co.PA Father: Unknown LAWRENCE Mother: UNKNOWN Note 3: Ida L. nee Laurence/Lawrence Pettis Culbertson is possibly the dau or a neice of Eli Lawrence & Priscilla Woodward; bz/torey/2015. Note 4: Arlington.IA paper,Obit: Father b. VT, mother NH. Grew up & educated in NY, taught school several years before 1st marriage (to Capt. Charles E. Pettis). Note 6: Ida's birth? Census years: 1870PA, 1880PA, 1900IN(error), 1910NY, 1915NY. Note 7: Ida's birth? 1915 Census for son Eugene states father b.PA, mother Ida NY; 1925 for both son Eugene & dau Alla Ward states mother Ida Laurence b.PA. Note 8: 1855 Census1855, searching NY state for given name Ida b.1845+/-2y, only one possibility found: 1855 New York City Census (but all are listed born in Germany), Larence: Fredrick42 (living in NY City 2yrs), Caroline34, Frerick14, Ida8, Dora6. Note 9: 1850 Census: ?? No Ida Unknown1845 matches found in NY or PA 1850 or 1860, bz/2015. Note 10: 1860 Census (only NY or PA found, age 5yrs older): Caskill, Greene.Co.NY; Laurence: Neely67 farming $9600, Catherine59, MerchantW35, MaryA24, IdaC20, JnoW18, Robt14, Louisa16. Note 11: Bet. 1866 - 1867 Ida married Capt. Chas.E. Pettis in Garland, Warren.Co.PA. Note 12: 1870 Census: Garland, Pittsfield.Twp, Warren.Co.PA. Pettis/Peters: C.E.33VT lumbering, Ida25PA, Lillian2PA, Stephen Holsmer41PA lumbering. Note 13: Nov 1871 Speculation: Ida L. Lawrence divorces Charles E. Pettis late 1870/early 1871 & remarried Morris Eugene Culbertson 1871Nov, dau Lillian immediately takes the Culbertson surname; bz/torey/2015. Note 14: 1874 Obit: Morris/Ida Culbertson Family moved from Warren.Co.PA to Illyria village neigorhood in NW corner of Illyria.Twp, Fay.Co.IA. 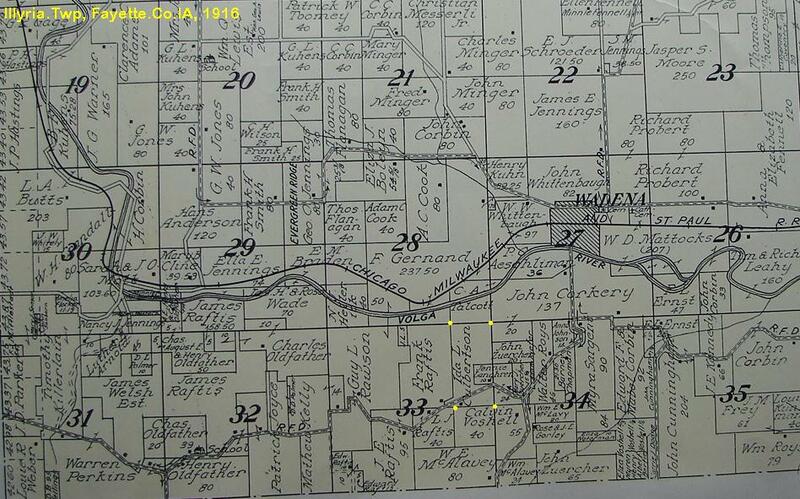 Note 18: 1880 Census: Near Gilson & Sargent in NW corner of Illyria.Twp, Fay.Col.IA. Culbertson: MorrisE34PA farming, IdaL35PA nee Lawrence Peters, s/dau Lillian12PA Peters, Ernest4IA, IdaA1IA. Note 21: Aft. 1905 After Ida's husb. Morris died, she remained on Sec 33 farm, Illyria.Twp. Note 22: 1910 Census: Illyria.Twp, Fay.Co.IA. Culbertson: Eda/IdaL63NY widow 5ch/3living father b.VT mother b.MA, son EugeneE35 farming, dau/law KatieM29 parents b.Eng. Note 24: 1915 Census: Wadena P.O. Illyria.Twp, Fay.Co.IA. Ida L. Culbertson 69/NY, 1yr college, farm value $6500, father b.VT, mother MA. Note 25: 15 Jul 1915 Arlington.IA paper: Mrs. Ida Culbertson of Pleasant Ridge (neighborhood 2mi SW of Wadena on Fayette road), spending few wks with dau (Lillian Able Paul) in Smithfield.Twp. Note 29: Member of Wadena.IA Presbyterian Church. Note 30: Arlington.IA 1915Oct17 paper: death notice states b.1846Oct, age 69y, very ill last 1.5y (speucatlion TB, bz/2015). .......................... 12 CULBERTSON, Ernest Eugene 'Gene' b: 1877 in Sec 33 farm, 1.5mi SW of Wadena, Illyria.Twp, Fay.Co.IA. d: 1959 in Illyria.Twp, Fay.Co.IA? Burial: Wadena Cem, sec 3, Illyria.Twp, Fay.Co.IA. Note 10: 1915 Living on home farm in NW corner area of Illyria.Twp, Fay.Co.IA. Note 12: 1925 Census: Illyria.Twp, Fay.Co.IA. Culbertson: E.E.47, Katie44, Donna11. ............................. 13 CULBERTSON, Morris Eugene b: 07 Jul 1911 in Illyria.Twp, Fay.Co.IA d: 07 Jul 1911 in Illyria.Twp, Fay.Co.IA Burial: Wadena Cem, Illyria.Twp, Fay.Co.IA. .......................... 12 CULBERTSON, Ida Alia 'Allie' b: 1879 in Sec 33 farm, 1.5mi SW of Wadena, Illyria.Twp, Fay.Co.IA. Note 11: 1915 Living Arlington area, Fay.Co.IA. Note 22: 1925 Census: Fairfield.Twp, Fay.Co.IA. Ward: Arthur50 farming, Alla nee Culberston46, Roy21, Ullah16. ........................ 11 CULBERTSON, John J. b: Bef. Dec 1849 in Tidioute area, Deerfield.Twp, Warren.Co.PA Note 9: 1870 Census: Putnam.Twp, Fay.Co.IA. Elijah Westfall34NY major farmer $12k/3264 family; farmhands Eugene20PA & John21PA Culbertson. ........................ 11 CULBERTSON, Frank D. b: 04 Apr 1859 in PA or NY d: 1904 in Yankton.Co.SD Burial: Yankton City Cem, Yankton.co.SC. Note 4: Fay.Co.IA.1878.Hist: Lists birth as 1859Apr01. ........................ 11 CULBERTSON, Charles Lawrence b: 28 Feb 1863 in Tidioute area, Deerfield.Twp, Warren.Co.PA d: 21 Nov 1917 in Chamberlain, Brule.Co.SD Burial: Riverview Cem, Chamberlain, Brule.Co.SD or Oak Hill Cem, Tama, Tama.Co.IA. Note 4: Fay.Co.IA.1878.Hist: Lists birth as 1864Feb09. .......................... 12 CULBERTSON, Laverne S. b: 1900 in Tama, Tama.Co.IA d: 1933 in Chicago.IL; res of Bloomington, Grant.Co.WI Note 11: 1917 Obit: Enlisted in Army, served in France as member of Sand Storm Division. Note 16: Worked for Interstate Power in McGregor.IA, followed by manager in Bloomington.WI. ........................ 11 CULBERTSON, Ida Belle b: 22 Jul 1865 in Tidioute area, Deerfield.Twp, Warren.Co.PA d: 1918 in Fay.Co.IA Burial: Grandview Cem, Sec G, Lot 321, Fayette, Fay.Co.IA. ........................ 11 CULBERTSON, Sarah Elizabeth b: 12 Jan 1867 in Tidioute area, Deerfield.Twp, Warren.Co.PA d: 18 Nov 1955 in Dolores, Montezuma.Co.CO Burial: Cortez Cem, Montezuma.Co.CO. ........................ 11  CULBERTSON, Susan Jeanette 'Susie' b: 26 Aug 1871 in Tidioute area, Deerfield.Twp, Warren.Co.PA d: 09 Jan 1910 in Fayette, Fay.Co.IA. Burial: 12 Jan 1910 Grandview Cem, Sec G, lot 323, in S half, burial #1002, Fayette, Fay.Co.IA. Note 4: Fay.Co.IA.1878.Hist: Lists name as Susan G. Note 6: Bet. 1872 - 1873 Came with parents to IA when a baby. Note 8: 1883 Moved with parents to NE. Note 10: Abt. 1891 Returned to farm E of Fayette.IA after marriage to Fred Smith. Note 12: 1903 Moved into Fayette village after death of husb. Fred Smith. Note 14: Aug 1907 Moved to Dickinson (old O.G. Fussell) farm (renting) 3mi E of Fayette, mid-S portion of sec 25, Westfield.Twp, after 2nd marriage to JonE.Burns. Note 22: Obit: age at death 38y5m24d. Note 28: Buried under Smith surname with first husb. FredR Smith in Grandview.Cem. .............................. +SMITH, Fredrick R. 'Fred' b: 05 Oct 1865 in Sec 15, 1mi N of Taylorville, Fairfield.Twp, Fay.Co.IA. d: 25 Dec 1902 in Sec 6, Fairifeld.Twp, Fay.Co.IA Burial: 27 Dec 1902 Grandview Cem, Sec G, lot 323, burial #825, Fayette, Fay.Co.IA. m: Abt. 1891 in Fay.Co.IA? Father: Hiram C. SMITH Mother: Mary A. REED Note 6: 1880 Census: 1m N Taylorville, mid-E, sec 15, 40a, Fairfield.Twp. Smith: Hiram46, MaryA47, Frank16, Fred14, Edna9, James7, Lura4, Alice2. 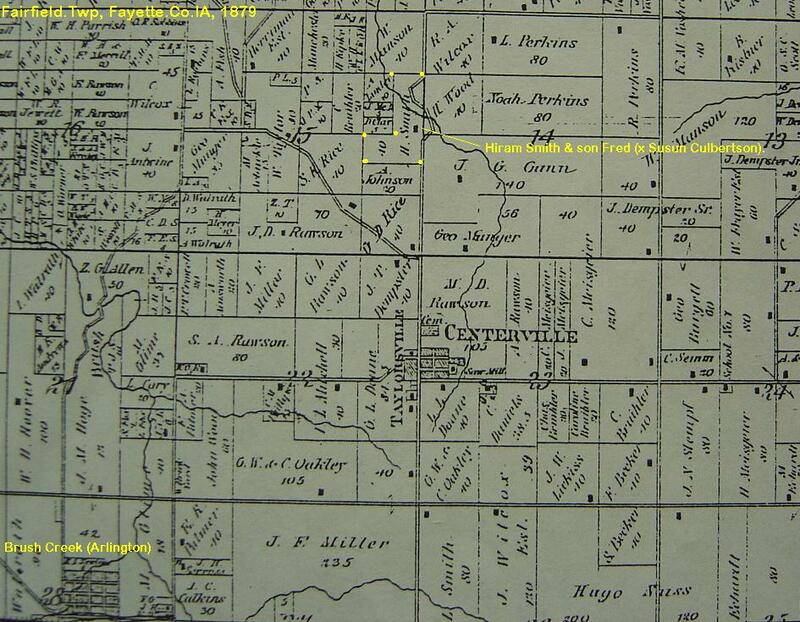 Note 7: 1885 Censes: 1m N of Taylorville, Fairfield.Twp, Fay.Co.IA. Smith: Hiram50, Mary51, Fred19, Adedney14, Jmaes11, Louis8. Note 9: Bet. 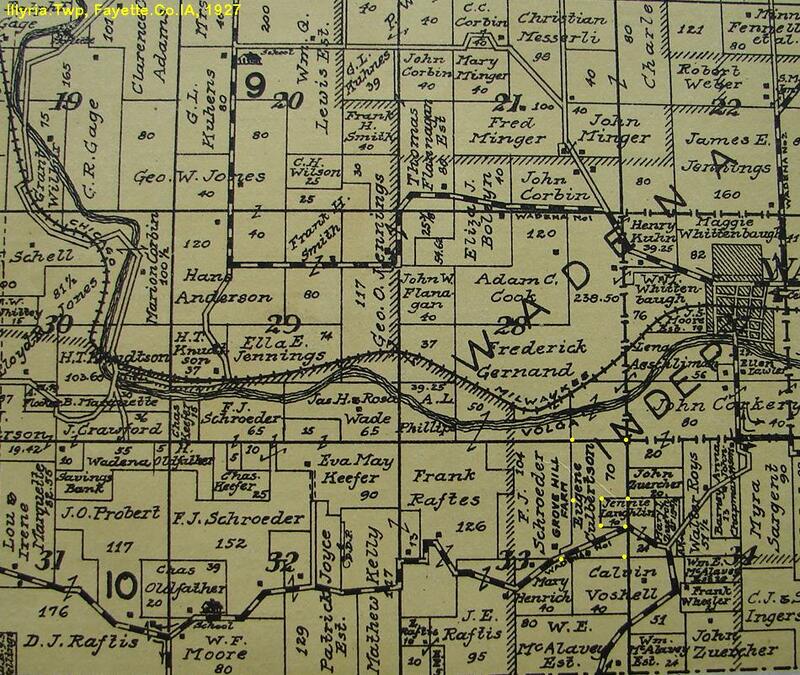 1892 - 1894 Moved back from NE to farm adj/near father Hiram in sec 6, Fayette.Co.IA. Note 10: 1895 Census: in northeast corner of Fairfield.Twp (sec 6), Fay.Co.IA. Note 12: 1900 Census: Sec 6, Fairfield.Twp, Fay.Co.IA. Smith: FredR34 farming, Susie28 nee Culbertson, Jessie9, FloydH5. Note 13: 1900 Census: adj is father. Smith: Hiram64, Mary A64, son JamecC28, his wf CoraM21, their dau ClarkD9m. .............................. +BURNS, Jonathan E. 'John' b: 25 Dec 1862 in McLean.Co.IL d: 29 Jul 1932 in McGregor, Clayton.Co.IA m: 26 Aug 1907 in Fayette, Fay.Co.IA Father: Levi Walter BURNS Mother: Harriet Marie WAITE Note 7: 1880 Census; sec 14&11 farm 1/2mi W of Lima, Fay.Co.IA. Burns: LeviW44 carpenter, HarrietM43, WmW20 farmer, JonE18 farmer, HarrietE16 domestic, RobertB15, LeviW9, MaryL8, CharlesH3. 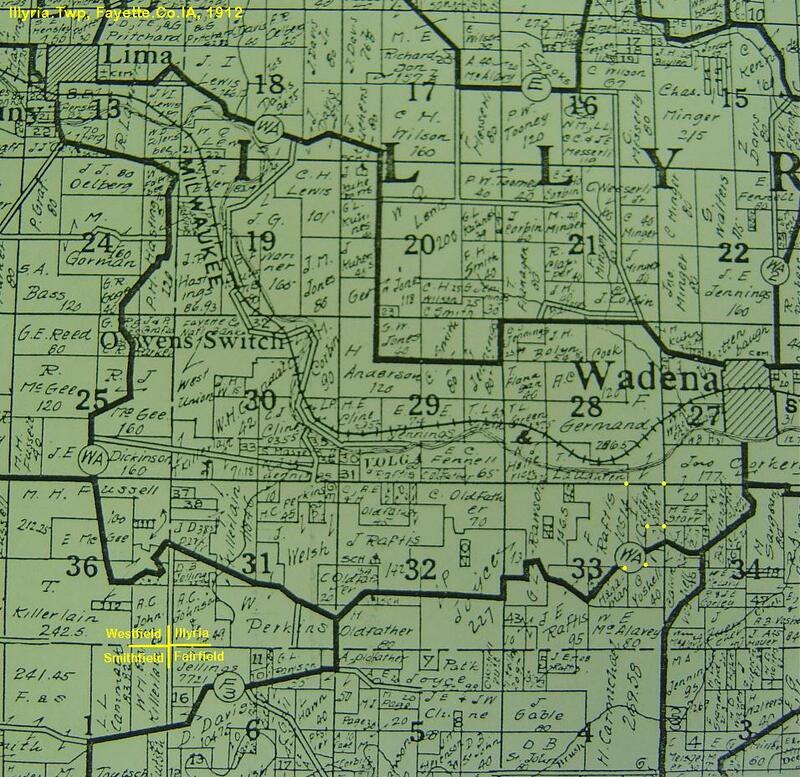 Note 9: 1885 Census: 1mi NW of Wadena, NE corner of sec 28, Illyria.Twp, Fay.Co.IA. Burns: LeviW1836, HarietM1843, WmW1860, JonathanE1862. Note 12: 1895 Census: Westfield.Twp, Fay.Co.IA. Burns: JohnE33 carpenter, ArtieE25, EvaL6, May4, Pearl1. Note 13: 1900 Census: 2-3 bk S of Main.St in Fayette, Fay.Co.IA. Burns: JohnE1861, ArtieE1869, EvaL1888, May1890, Pearl1893, Hazel1897. Note 14: Abt. 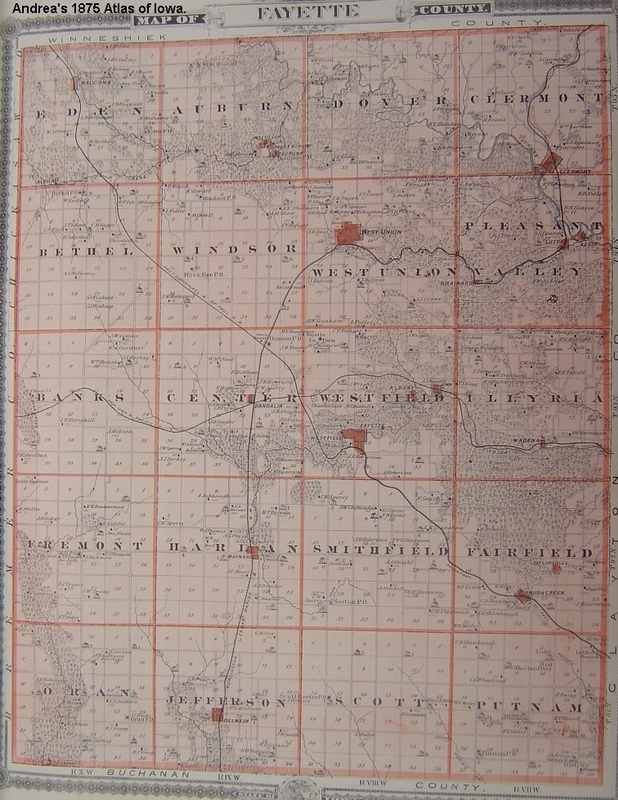 1904 Moved to Centralia, Nemaha.Co, northeastern KS, then back to Fay.Co.IA by 1907. Note 16: 1905 Census: Centralia, Nemaha.Co..KS. Burns: J.E.47, A.E.36, EvaL16, MayI14, Pearl12, Hazel8, BulaR3. Note 17: 1906 Living in Atchison area, Atchison.Co. northeast KS; returned to Fay.Co.IA by Aug1907. Note 18: Aft. Aug 1907 Moved to Dickinson (old O.G. Fussell) farm (renting) 3mi E of Fayette, mid-S portion of sec 25, Westfield.Twp, after 2nd marriage to Susan Culbertson Smith. Note 20: Jan 1910 Second wife Susan died. Note 22: 1910 Census: Fayette village, Fay.Co.IA. Burns: JohnE48 widower carpenter, IolaM19, NoraP17, MinnieE12, LyleB1y9m. Note 23: Aft. 1910 Carpenter in Volga, Clayton.Co.IA. Note 26: 1920 Census: Butler.St, Volga, Sperry.Twp, Clatyon.Co.IA. Burns: John58 (JonathanE) shoe shop repairman, Alminda63 (Clarinda A. 'Rindy' nee Graves Wroe Rogers) Lyle11. Note 28: 1930 Census: S. Church.St, Prairie.du.Chien.WI. Downing: LeornardJ41IA ice cream factory man'g, Margaret39AR, Helen17AR, HaroldJ15IA, f/alw John Burns67IA wid. .......................... 12  BURNS, Lyle Burdell b: 10 Jul 1908 in Fayette, Westfield.Twp, Fay.Co.IA d: 04 Apr 1989 in Hosp in Yuma.AZ; res. of Winterhaven, Imperial.Co.CA Note 8: Aft. 1910 Obit: grew up & attended school at Volga, Clayton.Co.IA. Note 15: Aft. 1957 Worked for U.S. Forestry Service & CA St. Beaches/Parks. ................................ +GRAY, Winifred b: 28 Aug 1913 d: 01 Jun 1993 in Arlington, Fairfield.Twp, Fay.Co.IA m: Feb 1931 Note 11: 1931 From Fayette at time of marriage. ............................. 13 BURNS, Gwendolyn Note 8: 1989 Living at Volga, Clayton.Co.IA. ............................. 13 BURNS, Lee Note 8: 1989 Living at Simi Valley, CA. ............................. 13 BURNS, Roland Note 8: Living at LynnWood.WA. 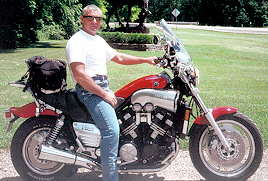 ............................. 13 BURNS, Kenneth Note 8: 1989 Living at Arlington, Fay.Co.IA. ........................ 11 CULBERTSON, Warren Samuel b: 13 Jan 1875 in Sec 8, Smithfield.Twp, Fay.Co.IA d: 25 Apr 1953 in Home in Fayette, Westfield.Twp, Fay.Co.IA Burial: Grandview Cem, sec G, lot 325, 2nd from S, box, burial #2301, Fayette, Fay.Co.IA. Note 4: Oibt, parents: Thomas Montgomery Culbertson & Celestial Ann Lawrence. 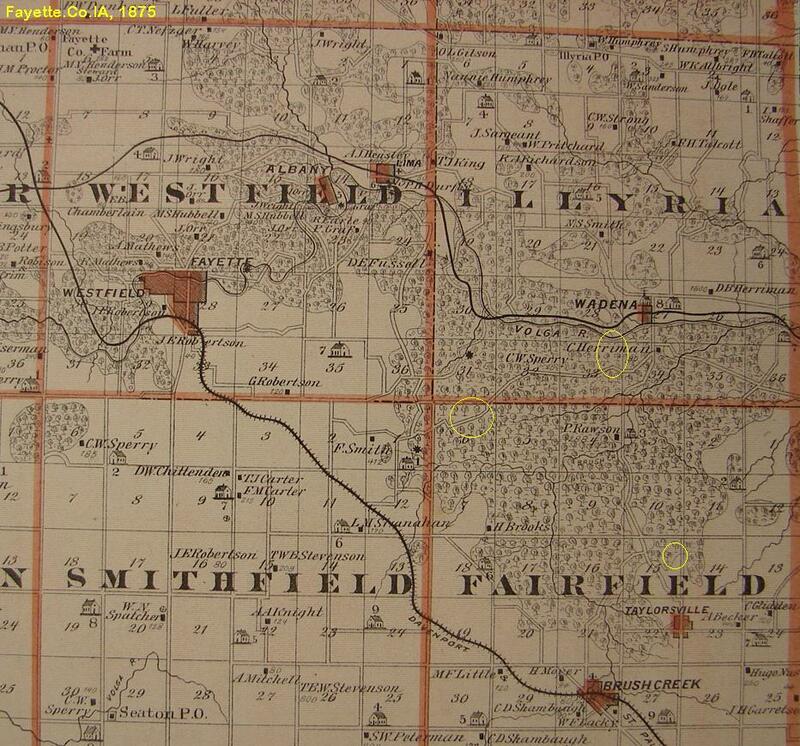 Note 8: 1885 Census: NEofNW, sec 8, Smithfield.Twp, Fay.Co.IA. Culbertson: T.M.64 farming, Celestia44, Frank24, Nellie23, Chas.21, Bella19, Sarah17, Susan13, Mary11, Warren9, Rocher7, Lulu4, Prissilla Lawrence78. Note 9: Spent teenage years with sisters in SD after parents died; returned to Fayette before 1900. Note 10: 1900 Census: Westfield.Twp, Fay.Co.IA. Culbertson: Wayne/Warren25 farming, Zoe nee Kuhens22. Note 11: Bet. 1900 - 1908 Obit: farmed west of Fayette, moved to farm east of Fayette, ill health, 1908 moved into Fayette, worked as wall paperer & painter. Note 12: 1910 Census: Fayette village, Fay.Co.IA. Culbertson: Warren35 painter, ZoeE nee Kuhens31, EdithC7. Note 16: 1925 Census: Fayette village, Fay.Co.IA. Culbertson: W.S.50, Teve nee Kuhens45. Note 19: Caretaker of Grandview Cem in Fayette.IA for seven years. Note 22: Cause of death listed; coronary. .............................. +KUHENS, Emma Zoe b: 04 May 1878 in East of Lima in Illyria.Twp, Fay.Co.IA d: 27 Jul 1967 in Fayette County Home, Sec 6, Westfield.Twp, Fay.Co.IA Burial: 28 Jul 1962 Grandview Cem, sec G, 2nd from S, burial #2591, Fayette, Fay.Co.IA. m: 21 Mar 1900 in Lima Church, Westfield.Twp, Fay.Co.IA Father: John KUHENS Mother: Rebecca Jane WROE Note 11: 1949 Obit: shut-in after a broken hip. Note 22: Cause of death; listed hemmorage. Relative: dau Coralie Clendenen. .......................... 12 CULBERTSON, Charles Lawrence b: Abt. 01 Apr 1901 in Fay.Co.IA d: Abt. 04 Apr 1901 in Fay.Co.IA Burial: Grandview Cem, sec G, lot 325, burial #796, Fayette.IA. .......................... 12 CULBERTSON, Edith Caroline 'Coralie' b: 08 Sep 1902 in Fay.Co.IA d: 12 May 1984 in Fay.Co.IA? Burial: 14 May 1983 Grandview Cem, Sec G, lot 323, burial #3106, Fayette, Fay.Co.IA. ................................ +CLENDENEN, Harold George b: Oct 1902 in Iowa d: 07 Oct 1972 in Fayette Co. Home, Fay.Co.IA. Burial: 10 Oct 1972 Grandview Cem, sec G, lot 325, 4th from S, burial #2843, Fayette, Fay.Co.IA. Father: George H. CLENDENEN Mother: M. Isabell UNKNOWN Note 22: Cause of death: listed natural causes. ............................. 13 CLENDENEN, Betty Jean b: 08 Sep 1930 in Fay.Co.IA? d: 03 Dec 1989 Note 11: 1953 Living at Leesville.LA. ........................ 11 CULBERTSON, Richard Lee 'Richie' b: 06 Dec 1877 in Sec 8, Smithfield.Twp, Fay.Co.IA d: 01 Aug 1955 in York, York.Co.NE Note 12: 1910 Census: Baker.Twp, York.Co.NE. Culbertson: Rich33 farming, Edith34, Fay8, Maude4. Note 14: 1920 Census: York City, LeRoy.Twp, York.Co.NE. Culbertson: Rich.Lee44 salesman of farmers insurance, Edith44IN, Fay18NE teacher, Maude14NE, Ina8Ne, Hazel4y4mNE, f/law John Morss86IN, lodgers Geo.Spears71WI Marjory Spears20WA. Note 18: 1940 Census: York, LeRoy.Twp, York.Co.NE. Culbertson Richard62IA fuel oil distributor, Edith64. Note 22: 1953 Living at York, LeRoy.Twp, York.Co.NE. ........................ 11 CULBERTSON, Harrison L. b: 20 Aug 1882 in Sec 8, Smithfield.Twp, Fay.Co.IA d: 25 Aug 1884 in Sec 8, Smithfield.Twp, Fay.Co.IA Burial: 27 Aug 1884 Grandview Cem, sec A, childrens area?, burial #434, Fayette, Fay.Co.IA. ..................... 10 CULBERTSON, John Harrison b: 06 Aug 1823 in Crawford.Co.PA d: 25 Dec 1875 in Strawberry.Pt area, Clayton.Co.IA Burial: Strawberry.Pt Cem, Clayton.Co.IA. Note 5: 1850 Census: Deerfield.Twp, Warren.Co.PA. Culbertson: John56 innkeeper, Eliz58, Thomas30 carpenter, JohnH27 innkeeper, William19 miller, Mary22, Morris4, MarthaAnn2, JohnJ0, Ann Hollenback18. Note 6: 1860 Census: Deerfield.Twp, Warren.Co.PA. Culbertson: Harrison37 farming $500/300, Mary32, John10, Euguen8, Geo6, Ira5, Herbert3, Samuel2m; Samuel42 oil speculator family adjcent. Note 7: Jun 1863 Draft.Reg: JohnH Culbertson 39y, clerk, Philadelphia.PA. Note 8: Abt. 1865 DRaft.Reg: Warren.Co.PA, JohnH Culbertson, 42y, 5'10", bl eyes, light hair, fair complextion, born Crawford.Co.PA. Note 11: 1870 Census: Strawberry.Pt area, Cass.Twp, Clayton.Co.IA. Culbertson: John47 farming $8k/1000, Polly Jane42NY, GeoD17, IraW15, Herbert13, SamuelH10, Louisa6PA, Milla2IA, Alonza9m, mother Eliz79PA, MattieA22PA teacher. ........................... +MERRITT, Mary Jane 'Polly' b: 08 Dec 1827 in Chautauqua.Co.NY d: 31 Aug 1907 in Edgewood, Delaware.Co.IA Burial: Strawberry.PT Cem, Clayton.Co.IA. m: in Crawford.Co.PA Father: Thomas Jefferson MERRITT Mother: Jane 'Polly' WRIGHT Note 10: 1870 Census: Strawberry.Pt area, Cass.Twp, Clayton.Co.IA. Culbertson: John47 farming $8k/1000, Polly Jane42NY, GeoD17, IraW15, Herbert13, SamuelH10, Louisa6PA, Milla2IA, Alonza9m, mother Eliz79PA, MattieA22PA teacher. Note 12: 1880 Census: Cass.Twp, Clatyon.Co.IA. Culbertson: PolleyJ52, Homer20 farming, Louesa16, Millie12, Alonzo10. 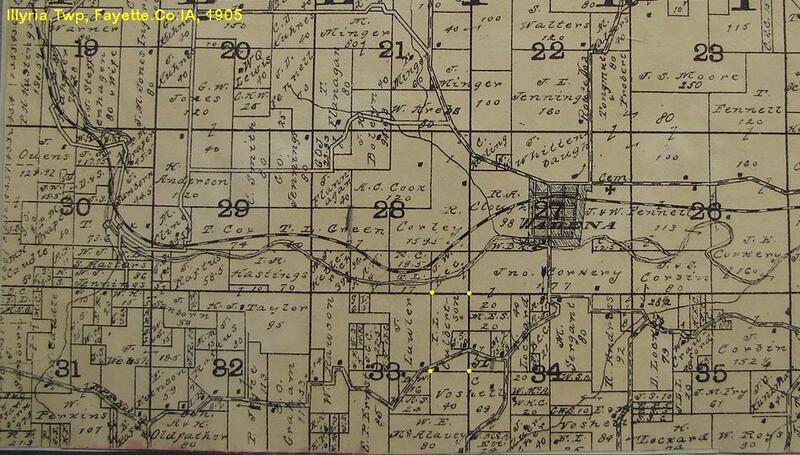 Note 14: 1885 Census: 80a, E1/2 of SE1/4, Sec23, Cass.Twp, Clayton.Co.IA. Culbertson: PollyJ53, IraW31 farming, Allie30, SamuelH25 artist, Millie17, Lennie16. ........................ 11 CULBERTSON, John Thomas b: 27 Apr 1850 in Tidioute area, Deerfield.Twp, Warren.Co.PA d: 28 Jun 1928 in St.Louis.Co.MN Note 8: 1870 Census: Putnam.Twp, Fay.Co.IA. Westfall: Elfah34NY farm $12k/3265, Alice26NovaSco, Ray1IA, Arthur4mIA; Eugene20PA & John21PA farmhands, Juley Bryce20IN maid, Elbert Dunam14Eng. Hough: Archer30MI $4200/400, Isadore26MI Allison4MI, Grand3mIA. ........................ 11 CULBERTSON, Eugene Merritt b: 02 Jul 1851 in Tidioute area, Deerfield.Twp, Warren.Co.PA d: 05 Jul 1936 in Arnolds Park, Dickinson.Co.IA Burial: Strawberry.Pt Cem, Clayton.Co.IA. Note 8: 1870 Census: Putnam.Twp, Fay.Co.IA. Westfall: Elfah34NY farm $12k/3265, Alice26NovaSco, Ray1IA, Arthur4mIA; Eugene20PA & John21PA farmhands, Juley Bryce20IN maid, Elbert Dunam14Eng. Hough: Archer30MI $4200/400, Isadore26MI Allison4MI, Grand3mIA. Note 21: 1931 Obit for Wm.Herbert Culbertson mentions brother Gene living near Spencer.IA. ........................ 11 CULBERTSON, George D. b: 06 Aug 1853 in Tidioute area, Deerfield.Twp, Warren.Co.PA d: 15 May 1908 in Elk.Twp, Clayton.Co.IA Burial: Edgewood Cem, Delaware.Co.IA. .......................... 12  CULBERTSON, Earle Floyd b: 22 Mar 1888 in Clay Center, Clay.Co.KS d: 10 Aug 1977 in Manchester, Delaware.Co.IA Burial: Edgewood Cem, Delaware.Co.IA. ........................ 11 CULBERTSON, William Herbert b: 29 Aug 1856 in Tidioute area, Deerfield.Twp, Warren.Co.PA d: 01 Jul 1931 in Edgewood area, Delaware.Co.IA Burial: Edgewood Cem, Delaware.Co.IA. .......................... 12  CULBERTSON, Roy D. b: 25 Oct 1881 in Elk.Twp, Clayton.Co.IA d: 30 Dec 1970 in Edgewood, Delaware.Co.IA Burial: Edgewood Cem, Delaware.Co.IA. Note 8: Bef. 1916 Divorce from Ella Thomas, remarried. ............................. 13 CULBERTSON, Dorothy b: 1907 d: 1956 Burial: Grant View Cem, Greeley, Delaware.Co.IA. .............................. +HUTTTON, Ira Note 8: 1931 Living at What Cheer, IA. .............................. +BERRIE, William Berry Note 8: 1931 Living at Roann.IN. ........................ 11 CULBERTSON, Alonzo Leroy 'Lennie' b: 05 Sep 1869 in E1/2ofSE1/4, Cass.Twp, Clayton.Co.IA d: Aft. 1931 Note 12: 1931 Farming near Greeley, Delaware.Co.IA. ..................... 10 D, William, Culbertson b: Bet. 1831 - 1834 in Crawford.Co.PA Note 5: 1850 Census: Deerfield.Twp, Warren.Co.PA. Culbertson: John56 innkeeper, Eliz58, Thomas30 carpenter, JohnH27 innkeeper, William19 miller, Mary22, Morris4, MarthaAnn2, JohnJ0, Ann Hollenback18. Note 6: 1860 Census: Deerfield.Twp, Warren.Co.PA. Culbertson: WmD26 miller, Susan26, Wm5, Emma3m, mother Elizabeth69. Note 8: Abt. 1865 Draft.Reg: Warren.Co.PA, Wm.D Culbertson, 32y 5'11+", grey eyes, br hair, light complextion, born Crawford.Co.PA. ...Married Charles E. Abel first; Orange Paul second. ...Lillian is the dau of Capt. Charles E. Pettis & Ida L. Lawrence. ...Lillian is nee Pettis, not nee Peters has referenced in some old Iowa paper obits. ...The tree below was produced by Torey&BZ/2015Mar, and is the most likely best guess association to date. ...Ida L. Lawrence divorced Charles E. Pettis and immediately married Morris Culbertson before they came to Smithfield.Twp from PA.
...Lillian was known in Fayette.Co.IA by the Culbertson surname, which she took after her mother Ida remarried. Abel Charles E Abel Peters Lillian Margaret (adopted Culbertson) 1867/Warren.Co.PA-1919/Fay.Co.IA, 1st husb; 2nd husb, Orange Wendal Paul 1863/NY-1922/Fayette.IA. 26 Jan 1864 11 Jul 1905 Grandview Fayette Sec D. son of Henry Clay Abel 1837/Essex.Co.NY-1921/Oelwein.IA & Annette Baker 1839/Essex.Co.NY-1908/Oelwein.IA. Ch: Harry Morris1892, Marie1898, Clyde Charles1899. 1  PETTIS, Gideon b: 1797 in VT Note 4: Gideon's son Edwin died in Hood.River.Co.OR; the line of WmM. Pettis 1770/RI-1821/RI x Ruth Crandall 1771/RI-1837/RI, is found in Hood.River.Co.OR. ? ?related, or possible parents?? bz/2015. Note 8: 1830 Census: Harmony, Chautauqua.Co.NY. Pettis: Gideon, wife & dau under 5y. Note 10: 1850 Census: Harmony, Chautauqua.Co.NY. Pettis: Gedeon/Gideon53VT farming $500, Lydia39NY, Charles8NY, Cordelia5NY, Mary3NY. Note 12: 1855 Census: Harmony, Chautauqua.Co.NY. Pettis: Gideon55VT farming, Lydia46NY, Charles13NY, Corelia10NY, MaryJ8NY. Note 13: Oct 1857 Census: Fillmore.Co.MN. Pettis: Gideon59VT, Elizabeth48NY, Mary10NY, Cernelia12NY. Note 15: 1865 Census: Fillmore.Co.MN. Pettis: Gidion, Eliz, Caroline, Edwin. Note 17: 1875 Census: Fillmore.Co.MN. Pettis: Edwin46NY, Aletha41NY nee Calkins Aldrich, Homer16MN, Edwin2MN, Ellanor1MN; Aldrich step/ch, Jenet17, Aba11, WmG8; Pettis parents, Gurdeion/Gideon76VT, ElizV65NY. Note 18: 1880 Census: Fillmore.Co.MN. Pettis: Edward51NY farming, Alletha46IA, Homar21MN, Edwin8MN, Ellen6MN, Guideon4MN, s/son W/Wm Aldrick/Aldrich; father Guideon/Gidion Pettis81VT, step/mother Elizabeth Pettis 61VT. Note 20: May 1885 Census: Jordon.Twp, Fillmore.Co.MN. Pettis: Gideion86, Eliz74, Edwin56NY, A.A.52NY, Edwin12MN, Ella11MN, Gideon6MN. 2  PETTIS, Edwin b: May 1829 in Harmony, Chautauqua.Co.NY d: 17 Feb 1912 in Hood.River.Co.OR Burial: Idlewilde Cem, Hood River, Hood.River.Co.OR. Note 6: 1855 Fillmore.Co.MN.Hist: Edwin Pettis was one of the early pioneers, settling 3mi down Root River from Fillmore. Note 8: 1860 Census: Jordon.Twp, Fillmore.Co.MN. Petis/Pettis: Edwin35NY farming, CorolineC30NY, Homer1MN. Note 9: Abt. 1863 Civil War: Pvt. Co. B, 5th MN Inf. Note 10: 1870 Census: Fillmore.Co.MN. Pettis: Edwin41NY farming, Homer11MN. Note 12: 1875 Census: Fillmore.Co.MN. Pettis: Edwin46NY, Aletha41NY nee Calkins Aldrich, Homer16MN, Edwin2MN, Ellanor1MN; Aldrich step/ch, Jenet17, Aba11, WmG8; Pettis parents, Gurdeion/Gideon76VT, ElizV65NY. Note 14: 1880 Census: Fillmore.Co.MN. Pettis: Edward51NY farming, Alletha46IA, Homar21MN, Edwin8MN, Ellen6MN, Guideon4MN, s/son W/Wm Aldrick/Aldrich; father Guideon/Gidion Pettis81VT, step/mother Elizabeth Pettis 61VT. Note 15: 1885 Census: Jordon.Twp, Fillmore.Co.MN. Pettis: Gideion86, Eliz74, Edwin56NY, A.A.52NY, Edwin12MN, Ella11MN, Gideon6MN. Note 17: 1895 Census: Fillmore.Co.MN. Pettis: Aletha67NY, Ellen21MN, Gideon16MN. Note 18: 1900 Census: Cypress.Twp, Cavalier.Co.ND. Pettis: Edwin farming, wf Elletha, son EdwinP son GideonL, dau EllaM Chase, g/dau Clarice May Chase, g/dau Ruth Eulla Chase. ... 3 PETTIS, Henry E. b: 23 Jul 1854 in MN? d: 20 Aug 1863 in Fountain, Jordan.Twp, Fillmore.Co.MN Burial: Loughrey Cem, Fountain, Fillmore.Co.MN. ... 3 PETTIS, Hattie J. b: 23 Mar 1858 in Fountain, Jordan.Twp, Fillmore.Co.MN d: 10 Apr 1858 in Fountain, Jordan.Twp, Fillmore.Co.MN Burial: Loughrey Cem, Fountain, Fillmore.Co.MN. ... 3 PETTIS, Homer A. b: Jan 1859 in Fountain, Jordan.Twp, Fillmore.Co.MN d: 24 Feb 1931 in Hood.River.Co.OR Burial: Idlewilde Cem, Hood River, Hood.River.Co.OR. .... +CALKINS, Aletha A. b: Aug 1833 in NY d: 29 Nov 1914 in Hood.River.Co.OR Burial: Idlewilde Cem, Hood River, Hood.River.Co.OR. m: Abt. 1870 in Jordon.Twp, Fillmore.Co.MN Father: Alva CALKINS Mother: Anna UNKNOWN Note 11: 1875 Census: Fillmore.Co.MN. Pettis: Edwin46NY, Aletha41NY nee Calkins Aldrich, Homer16MN, Edwin2MN, Ellanor1MN; Aldrich step/ch, Jenet17, Aba11, WmG8; Pettis parents, Gurdeion/Gideon76VT, ElizV65NY. 2  PETTIS, Charles E. b: 26 Dec 1842 in Harmony, Chautauqua.Co.NY or VT d: 16 Jan 1919 in Youngsville, Warren.Co.PA Burial: Youngesville I.O.O.F. Cem, Warren.Co.PA. Note 2: NOTE, 2015Mar: Data searched, tree built for Charles E. Pettis x Ida L. Lawrence, bz/torey/2015. Note 3: Suspect: Gideion Pettis is the father of Capt. Charles E. Pettis but not confirmed; torey & bz/2015. Note 6: 1850 Census: ??? Note 7: 1860 Census: ??? Note 8: Bet. Jul 1863 - Jul 1865 From Warren.Co.PA, age 22y, mustered, into Co.C, 182nd Reg, 21st PA Cav; promoted 1st Serg>2nd Lt> 1st Lt> Captain> mustered out with the Company. Note 10: Bef. 1867 Charles & Ida married in Garland, Warren.Co.PA & had dau Lillian Margaret Pettis/Peters 1867Sep29 in Garland. 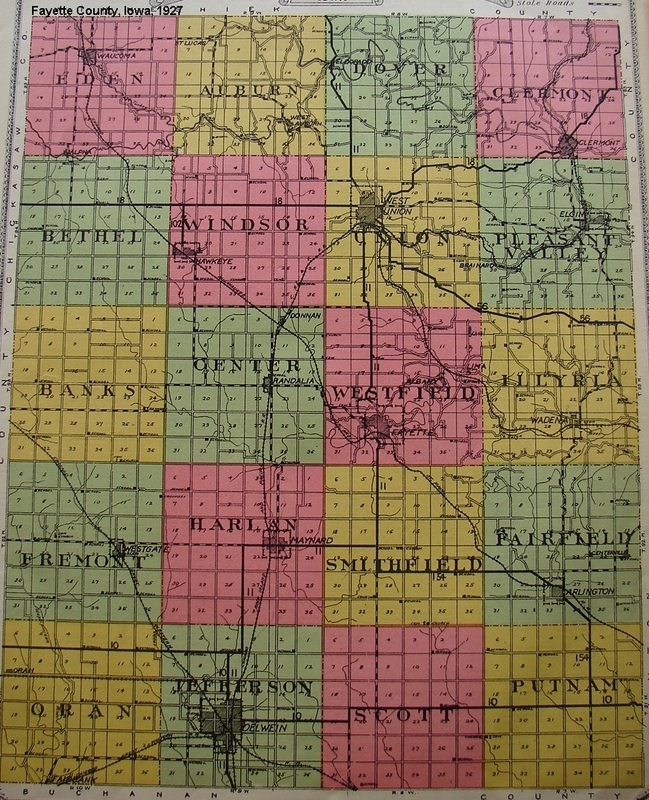 Note 14: 1870 Census: Garland, Pittsfield.Twp, Warren.Co.PA. Pettis/Peters: C.E.33VT lumbering, Ida25PA, Lillian2PA, Stephen Holsmer41PA lumbering. Note 15: 29 Sep 1870 Titusville.PA paper: Mrs. Charles (Ida) Pettis of Garland, accidently gave husb dose of acid instead of black oil, he spit it out, buring hole in carpet. In absence of wf from home he had place acid where oil had been; torey/2015. Note 16: Nov 1871 Speculation: Ida L. Lawrence divorces Charles E. Pettis & remarried Morris Eugene Culbertson 1871Nov, dau Lillian immediately takes the Culbertson surname; bz/torey/2015. Note 17: 1880 Census.Deaf/Mutes: Charles Pettis, Eldred, Warren.Co.PA, premature sight loss due to cannon discharge (during Civil War). Note 18: 1880 Census: Eldred.Twp, Warren.Co.PA. There is a Charles Pettis36PA boarding with the John Carson family. Note 19: 1885 CharlesE Pettis remarries RondaM nee Sharp Wentworth, remaining in Warren.Co.PA. Note 25: 1900 Census: Garland, Warren.Co.PA. Pettis: ChasE59VT farmer (parents b.Eng), RhodaM60PA 4ch/4living (father b.NY, mother ME), step/dau LouisaC Maurer b.Dec1882/PA (parents b.PA). Note 26: 17 Feb 1904 Titusville.PA paper: Capt.Chas.E.Pettis of Young Valley was awarded a pension of $36/month. Note 27: 31 Aug 1907 Titusvilel.PA paper: Chas.E.Pettis who sold his farm in the Cole Hill neighborhood, several months ago will more his family to Youngsville. Note 28: 1910 Census: Youngsville, Warren.Co.Pa. Pettis: CharlesE69VT parents b.England, 2nd wife (married 24y), RedaM70PA (father b.NY, mother ME), g/son James Morton17PA (father b.NY, mother PA). Note 30: Obit: Was 76 on 1918Dec26, member/active of Youngsville.PA, M.E. Ch & past Sunday School Sup't. Wife of 32y Rhoda survives, a dau & 3 g/ch in Iowa. .... +LAWRENCE, Ida L. Laurence b: 01 Oct 1845 in Suspect Chautauqua.Co.NY (bz/2015) d: 04 Oct 1915 in Sec 33 farm, 1.5mi SW of Wadena, Illyria.Twp, Fay.Co.IA. Burial: Wadena Cem, sec 2, Illyria.Twp, Fay.Co.IA. m: Abt. 1867 in Garland, Warren.Co.PA Father: Unknown LAWRENCE Mother: UNKNOWN Note 3: Ida L. nee Laurence/Lawrence Pettis Culbertson is possibly the dau or a neice of Eli Lawrence & Priscilla Woodward; bz/torey/2015. Note 4: Arlington.IA paper,Obit: Father b. VT, mother NH. Grew up & educated in NY, taught school several years before 1st marriage (to Capt. Charles E. Pettis). Note 6: Ida's birth? Census years: 1870PA, 1880PA, 1900IN(error), 1910NY, 1915NY. Note 7: Ida's birth? 1915 Census for son Eugene states father b.PA, mother Ida NY; 1925 for both son Eugene & dau Alla Ward states mother Ida Laurence b.PA. Note 8: 1855 Census1855, searching NY state for given name Ida b.1845+/-2y, only one possibility found: 1855 New York City Census (but all are listed born in Germany), Larence: Fredrick42 (living in NY City 2yrs), Caroline34, Frerick14, Ida8, Dora6. Note 9: 1850 Census: ?? No Ida Unknown1845 matches found in NY or PA 1850 or 1860, bz/2015. Note 10: 1860 Census (only NY or PA found, age 5yrs older): Caskill, Greene.Co.NY; Laurence: Neely67 farming $9600, Catherine59, MerchantW35, MaryA24, IdaC20, JnoW18, Robt14, Louisa16. Note 11: Bet. 1866 - 1867 Ida married Capt. Chas.E. Pettis in Garland, Warren.Co.PA. Note 12: 1870 Census: Garland, Pittsfield.Twp, Warren.Co.PA. Pettis/Peters: C.E.33VT lumbering, Ida25PA, Lillian2PA, Stephen Holsmer41PA lumbering. Note 13: Nov 1871 Speculation: Ida L. Lawrence divorces Charles E. Pettis late 1870/early 1871 & remarried Morris Eugene Culbertson 1871Nov, dau Lillian immediately takes the Culbertson surname; bz/torey/2015. Note 14: 1874 Obit: Morris/Ida Culbertson Family moved from Warren.Co.PA to Illyria village neigorhood in NW corner of Illyria.Twp, Fay.Co.IA. 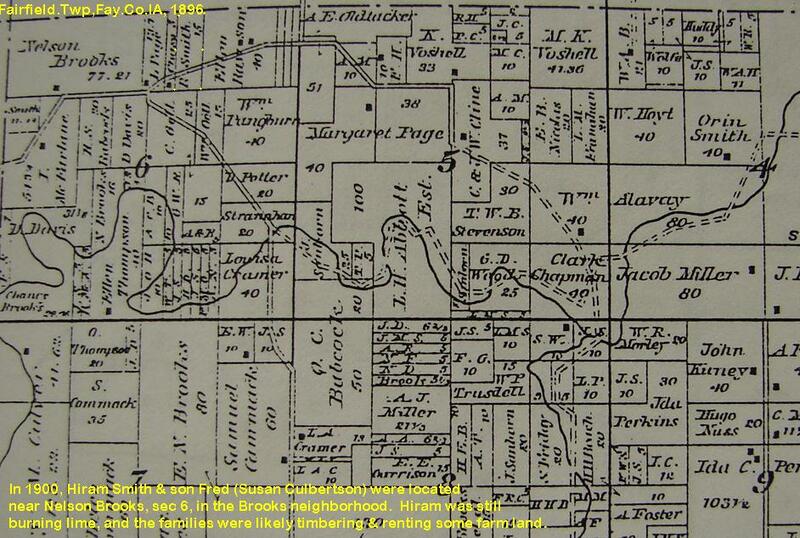 Note 18: 1880 Census: Near Gilson & Sargent in NW corner of Illyria.Twp, Fay.Col.IA. Culbertson: MorrisE34PA farming, IdaL35PA nee Lawrence Peters, s/dau Lillian12PA Peters, Ernest4IA, IdaA1IA. Note 21: Aft. 1905 After Ida's husb. Morris died, she remained on Sec 33 farm, Illyria.Twp. Note 22: 1910 Census: Illyria.Twp, Fay.Co.IA. Culbertson: Eda/IdaL63NY widow 5ch/3living father b.VT mother b.MA, son EugeneE35 farming, dau/law KatieM29 parents b.Eng. 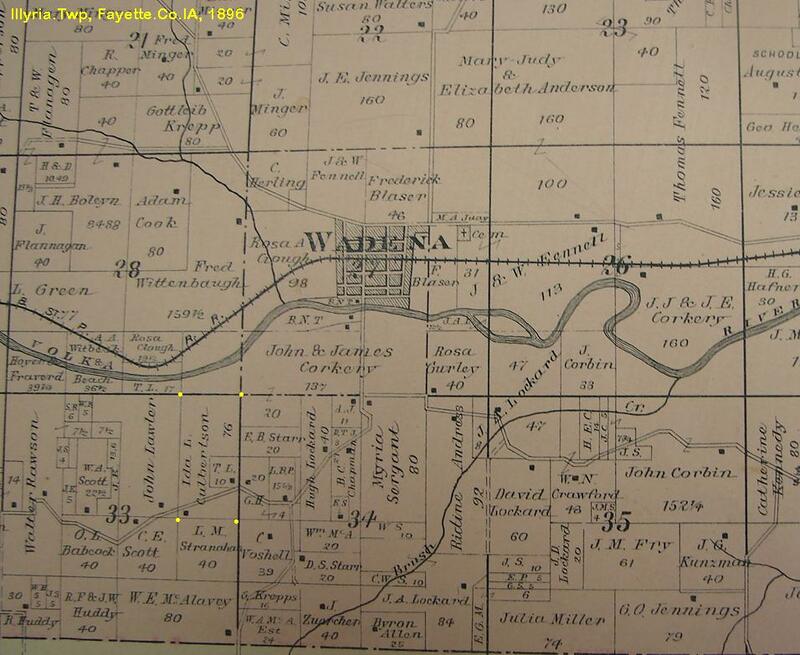 Note 24: 1915 Census: Wadena P.O. Illyria.Twp, Fay.Co.IA. Ida L. Culbertson 69/NY, 1yr college, farm value $6500, father b.VT, mother MA. Note 25: 15 Jul 1915 Arlington.IA paper: Mrs. Ida Culbertson of Pleasant Ridge (neighborhood 2mi SW of Wadena on Fayette road), spending few wks with dau (Lillian Able Paul) in Smithfield.Twp. Note 29: Member of Wadena.IA Presbyterian Church. Note 30: Arlington.IA 1915Oct17 paper: death notice states b.1846Oct, age 69y, very ill last 1.5y (speucatlion TB, bz/2015). ... 3  CULBERTSON, Lillian Margaret nee Pettis (adopted) b: 29 Sep 1867 in Garland, Warren.Co.PA d: 23 Jun 1919 in S.Main.St (adj W.E. Hunt), Fayette, Westfield.Twp, Fay.Co.IA. Burial: Grandview Cem, Sec D, Lot 417, S half, burial #1273, Fayette, Fay.Co.IA Note 5: 29 Sep 1867 Lillian was dau of Capt. Charles E. 1840/PA-1919/PA & Ida L. Lawrence; Lillian took surname of Ida's 2nd husb. Morris Eugene Culberton, coming from Warren.Co.PA to Fay.Co.IA in 1874, bz/2015. Note 6: See the Charles E. Pettis tree built by torey/bz 2015, for Lillian's birth father. Note 7: 1870 Census: Garland area, Pittsfield.Twp, Warren.Co.PA. Pettis: C.E.33VT lumbering, Ida25PA, Lillian2PA, Stephen Holsmer41PA lumbering. Note 8: Nov 1871 Ida nee Lawrence left/divorced Charels W. Pettis, 1870-1851and remarried Morris Eugene Culbertson 1846/PA-1906/IA. Note 9: Aft. 1874 Lillian was raised on the Morris/Ida Culbertson farm 1.5mi SW of Wadena in the SW corner of Illyria.Twp, Fay.Co.IA, the Pleasant Ridge neighborhood. Note 10: Attended Fayette.IA H.S., UIU normal, taught school for many years, where she met her first husb. Charles Abel. Note 12: 15 Feb 1890 Lillian nee Pettis Culbertson married a neighbor, Charels E. Able 1865-1905; they farmed just south of Fayette in Smithfield.Twp. Note 18: 1900 Census: Smithfield.Twp, Fay.Co.IA. Able: Charles37 farming, Lillian nee Pettis Culbertson32, Harry8, Myra2, Clyde1. Note 19: 1905 Census: Sec 11 area, Smithfield.Twp, Fay.Co.IA. Able: C.E., Lillian, Henry, Marie, Clyde. Note 20: Bet. Jul 1905 - Dec 1908 Charles Able dies 1906Jul, assume Lillian stays on Able farm in Smithfield.Twp; 1908Dec, Lillian remarries widower/neighbor Orange Paul, his 1st wf, dying of TB in 1907Jun. Note 21: 1910 Census: Cenenary Ch. area, Smithfield.Twp, Fay.Co.IA. Paul: Orange46 farming, 2nd wf/husb Lillian nee Pettis Culberton Able (CharlesE)42NY. Ch. on farm of: Orange.Paul; Floyd12, Beulah6, Jennie17, Harvey20. Lillian Able; HenryM18, Marie12, Clyde10. Note 22: Aft. 1915 Orange/Lillian Paul move from Smithfield.Twp farm to house on S.Main.St in Fayette.IA (assuming both were suffering from severe TB, bz/2015). Note 26: Oct 1919 Lillian dies at home on S.Main.St, Fayette.IA (cause of death not listed, obit states felt first symptoms abt Apr1919). Note 27: 1920 Census: S.Main.St (adj to W.E.Hunt), Fayette, Fay.Co.IA. Paul: Orange56 wid farmer, FloydA20 farmhand, BeulahB15, step/son, ClydeC Able20. Note 29: Oct 1922 Orange Paul, 2nd husb of Lillian died from Pulomany TB, Fayette, Fay.Co.IA. Note 30: Lillian is buried under the Paul surname with 2nd husb. Orange Paul. ....... +ABEL, Charles E. b: 26 Jan 1864 in North Hudson, Essex.Co.NY d: 11 Jul 1905 in Dubuque.IA; res of Smithfield.Twp, Fay.Co.IA. Burial: Grandview Cem, Sec D, Fayette, Westfield.Twp, Fay.Co.IA. m: 15 Feb 1890 in Fay.Co.IA Father: Henry Clay ABEL Mother: Annette BAKER Note 8: Charled E. Abel farmed in Smithfield.Twp, Fay.Co.IA. his entire life. Note 12: 1900 Census: Smithfield.Twp, Fay.Co.IA. Able: Charles37 farming, Lillian nee Pettis Culbertson32, Harry8, Myra2, Clyde1. Note 14: 1905 Census: Sec 11 area, Smithfield.Twp, Fay.Co.IA. Able: C.E., Lillian, Henry, Marie, Clyde. Note 15: 31 May 1905 Became ill with appendicitis. Note 16: 16 Jun 1905 Opertated on for Appendicitis at Finley Hosp in Dubuque.IA; appeared to be recovering slowly, relapsed/heart failure Jul09. Note 17: Services at Centenary Church in Smithfield.Twp. ..... 4 ABEL, Harris Morris 'Harry' b: 05 Jan 1892 in Sec 11 area, Smithfield.Twp, Fay.Co.IA. d: 18 Jan 1958 in Arlington, Fairfield.Twp, Fay.Co.IA Burial: Taylorville Cem, Fairfield.Twp, Fay.Co.IA. Note 11: 1919 Living at Oelwein, Fay.Co.IA. ..... 4 ABEL, Clyde Charles b: 01 May 1899 in Sec 11 area, Smithfield.Twp, Fay.Co.IA. d: 06 Jul 1973 in Stockton, San.Joaquin.Co.CA Note 11: 1919 Living at Fayette, Fay.Co.IA. Note 14: 1920 Census: S.Main.St (adj to W.E.Hunt), Fayette, Fay.Co.IA. Paul: Orange56 wid farmer, FloydA20 farmhand, BeulahB15, step/son, ClydeC Able20. ....... +PAUL, Orange Wendal b: 28 Jul 1863 in Day, Saratoga.Co.NY d: 13 Oct 1922 in S.Main.St (adj W.E. Hunt), Fayette, Westfield.Twp, Fay.Co.IA. Burial: Grandview Cem, Sec D, Lot 417, burial #1371, Fayette, Fay.Co.IA. m: 15 Dec 1908 in Fay.Co.IA Father: John Clark PAUL Mother: Mary Anne HOWE Note 6: 1860 Census: West Day P.O., Saratoga.Co.NY. Paul: Clark32 farming $1200/400, Mary Ann28, Jessie9, Imogine5, Euguene4, infant1m. Note 8: 1880 Census: Smithfield.Twp, Fay.Co.IA. Paul: J.C.52, Marey48, Orange16, Lottie14, Chs.13, Hurburt10, Albert7, G.H.2. Note 12: Bet. Jun 1907 - Dec 1908 First wife Sophia Yates dies of TB, 1907Jun; 1908, Orange married neighbor widow Lillian nee Pettis/Culbertson Abel. Note 16: 1910 Census: Smithfield.Twp, Fay.Co.IA. Paul: Orange46 farming, 2nd wf/husb Lillian nee Pettis Culberton Able (CharlesE)42NY. Ch. on farm of: Orange.Paul; Floyd12, Beulah6, Jennie17, Harvey20. Lillian Able; HenryM18, Marie12, Clyde10. Note 18: 1915 Orange & Lillian moved from Smithfield.Twp farm to house on S.Main.St in Fayette (have to assume Orange suffering series effects of TB, bz/2015). Note 23: Jun 1919 Second wf. Lillian dies at home in Fayette.IA (assume Lillian also contracted TB after 1908 marriage to Orange, bz/2015). Note 26: 1920 Census: S.Main.St (adj to W.E.Hunt), Fayette, Fay.Co.IA. Paul: Orange56 wid farmer, FloydA20 farmhand, BeulahB15, step/son, ClydeC Able20. Note 28: Oct 1922 Cause of death: Pulmonary TB (1st wf. Sophia Yates, died 1908 from TB). .... +SHARPE, Rhoda M. b: 22 Jun 1839 in Branch.Twp, Schuylkill.Co.PA d: 23 Oct 1923 in Youngsville, Warren.Co.PA Burial: Youngsville Cemetery, Warren.Co.PA m: 16 Apr 1885 in Youngsville, Warren.Co.PA Father: Eli B. SHARPE Mother: Sarah S. 'Sally' BARKER Note 8: 1850 Census: Pittsfield.Twp, Warren.Co.PA. Sharp: EliB46NY farming, Sally42ME, George17NY farmhand, Eli13PA, RhodaM11PA, Margaret6PA, Clara3PA. Note 12: 1870 Census: Brokenstraw, Warren.Co.PA. Sharp: EliB66NY farming $1500/300, SallyS61ME, ClaraA24PA; dau RodaM Wintworth30 & Wintworth ch. Helen9, Geo7, Loran6, Emma4, Note 28: Cause of death: Bronchio Pneumonia. .... +DAVIS, Wilber Frank b: Nov 1835 in PA d: 27 Nov 1927 in Koochiching, Koochiching.Co.MN m: 1863 in MN Note 8: 1870 Census: Fairmont, Martion.Co.MN Note 10: 1880 Census: farming, Wykoff, Fillmoe.Co.MN. 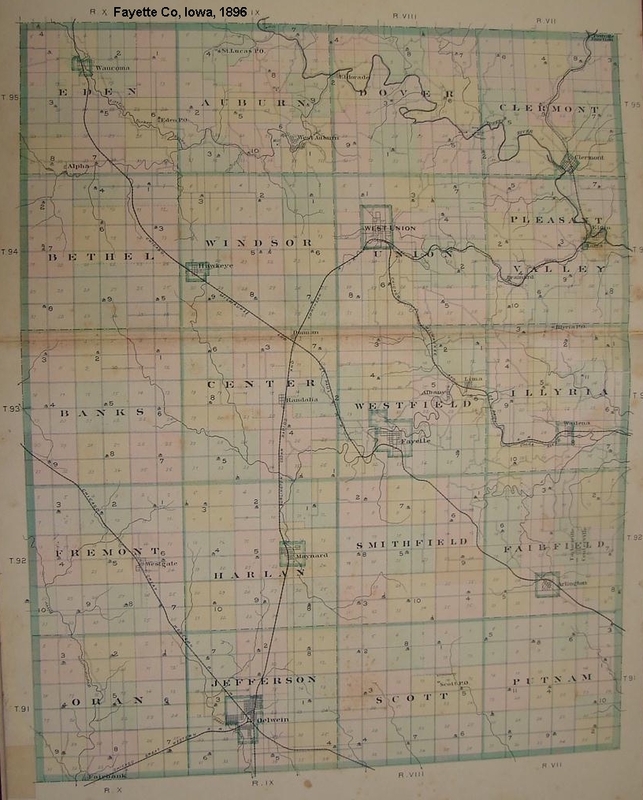 Note 14: 1900 Census: Bowdle, Edmunds.Co.SD. Note 16: 1910 Census: farming, Bowdle, Cottonwood Lake Twp, Edmunds.Co.SD. Note 18: 1920 Census: Ranier, Koochiching.Co.MN. 2 PETTIS, Mary b: 1848 in Harmony, Chautauqua.Co.NY Note 8: 12 Nov 1864 Fillmore.Co.MN.Hist: Mary Pettis who had resided with the Peter Johnson family set fire to his granary & 400bu wheat, 3mi S of Chatfield; she confessed, was acquited upon promising to reform. Dean Carlton Culbertson Culbertson son of Leroy Glesner 6 Mar 1915 21 Nov 1944 West Union West Union Son of Leroy Glessner Culberton 1882/Henry.Co.IA-1924/St.Petersburg.FL & Maude Mabel Blunt 1882/West.Union.IA-1965/St.Petersburg.FL. Served in 406th INF 102 Div. Buried at Masstreot, Netherlands; killed-in-action Oachen, Germany. Leroy Glessner Culbertson Blunt Maude Mabel 1882/West.Union.IA-1965/St.Petersburg.FL Oct 8, 1882 abt 16 Oct 1924 West Union West Union War Veteran. . Burial date 1924Oct18. Son of Houston Culbertwon 1835/Mansfied.OH-bef1900/IA? & Frances A. Hough 1854/PA-?/? Ch: Dean Carlton1914-1944. Maude Mabel Blunt Culbertson Leroy Glesner 1882/Union.Twp-1924/St.Petersburg.FL 10 Aug 1882 28 Sep 1965 West Union West Union Dau of James Henry Blunt 1853/OH-1931/Union.Twp & Florentina Mary Nefzger 1853/OH-1926/Union.Twp. Ch: Dean Carlton1914-1944. 2 CULBERTSON, John Housten b: 1798 in Fenton, Tyrone.Co.Ireland d: 12 Sep 1871 in Mansfield, Richland.Co.OH Burial: Mansfield, Richland.Co.OH Note 8: 04 Jul 1811 Arrived from Ireland to Boston, Suffolk.Co.MA. .... +UNKNOWN, Mary b: 05 Mar 1802 in Washington.Co.PA d: 21 Dec 1868 in Mansfield, Richland.Co.OH m: 1822 in Crab Apple, OH, Presb.Church. ..... 4 CULBERTSON, William M. 'Willie' b: 06 Jul 1871 in Washington.Co.IA d: 01 Apr 1936 in Washington, Washington.Co.IA Burial: Washington, Washington.Co.IA Note 8: 1900 Census: Washington, Washington.Co.IA. Culbertson: William28 laborer, NettieI26, NoraA6, AlbertL3. ..... 4 CULBERTSON, Leroy Glessner 'Lee' b: 08 Oct 1882 in Henry.Co.IA d: Abt. 16 Oct 1924 in St. Petersburg, FL Burial: West Union Cem, Fay.Co.IA Note 6: 1885 Census: Winfielk, Scott.Twp, Henry.Co.IA. Culbertson: Houston50OH inn keeper, FannieA31PA, Willie12IA, Estella8IA, LeroyG2IA, James Green31IA dry goods stocker, Richard Stinson33NY mechanic., Note 10: Aft. 1910 After marriage was a druggist in Oelwein, Fay.Co.IA. Note 11: 1915 Census: Nevada, Story.Co.IA. Note 12: 12 Sep 1918 Draft.Reg: Paton, Green.Co.IA. Lee G. Culbeerton, b.1882Oct08, drug store clerk, med ht/build, br hair/eyes. Note 18: 1920 Census: Elm.St, West.Union, Union.Twp, Fay.Co.IA. Culbertson: LeeG34 photography supplies salesman, MaudM33, DeanD4y9m. ......... +BLUNT, Maude Mabel b: 10 Aug 1882 in West Union, Union.Twp, Fay.Co.IA d: 28 Sep 1965 in New Fern Restorium, St. Petersburg.FL Burial: West Union Cem, Fay.Co.IA m: 14 Sep 1910 in James Blunt farm, Union.Twp, Fay.Co.IA Father: James Henry BLUNT Mother: Florentina Florinda Mary NEFZGER Note 8: Family moved from West.Union to Hawkeye, Fay.Co.IA when young. Note 9: Graduted from Hawkeye.IA H.S. Note 10: 1904 Graduated from UIU at Fayette.IA. Note 11: Aft. 1904 Taught high school at Lamont.IA, Sumner.IA, Bettineau.ND. Note 14: Aft. 1910 After marriage lived in Oelwein.IA where husband was a druggist. Note 22: 1925 Census: West Union village, Fay.Co.IA. Culbertson Maud nee Blunt41, son Leroy9. Note 23: Aft. 1925 Did grad work at St.U.of.IA & UofMich at Ann.Arbor; followed by teachin 20yrs at Fayette, Waterville, Keystone, Stanwood, Spingville. Note 25: Traveled Europe, US, Canada, Mexico, extensively. Note 26: Abt. 1950 Retired to St.Petersburg.FL. ........ 5 CULBERTSON, Dean Carlton b: 06 Mar 1915 in Nevada, Story.Co.IA d: 21 Nov 1944 in WWII, Aachen, Koln, North Rhine-Westphalia, Germany; killed in action. Burial: Maastreot, Netherlands; marker in West.Union Cem, Fay.Co.IA. Note 8: Abt. 1940 Attended UIU at Fayette.IA and Iowa State at Ames.IA. Note 11: WWII, Sergeant, 406th Inf, 102Mil Div. the burial in Fairbank.Cem, Oran.Twp, Fayette.Co.IA.